"When you don't have time to make your soup totally from scratch, this is a very easy, very good substitute." In a large pot over medium heat, melt butter. Cook onion and celery in butter until just tender, 5 minutes. 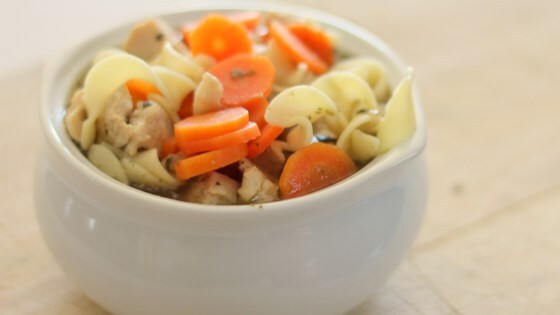 Pour in chicken and vegetable broths and stir in chicken, noodles, carrots, basil, oregano, salt and pepper. Bring to a boil, then reduce heat and simmer 20 minutes before serving. Good, but nothing extraordinary. Great base to start from. Thanks! This is so easy to make and so good! I cook the chicken breasts in the broth to make the broth a bit richer, then build the soup from there.